When a horse is startled or surprised by a predator, he will jump away from the offending object and may try to run away. This response is called spooking. Spooking is a natural reaction to a scary object and anyone who rides horses regularly will eventually have to deal with a spook, even if they ride a calm horse. Fortunately, spooking is not a big deal and most horses who are handled properly recover very quickly from the experience. Stay calm. If you are scared or frightened when your horse spooks, your horse will assume that his response is correct and there is a valid threat. If the horse believes you are scared, he will be much more difficult to calm. Sit down deep in your saddle, take a deep breath and calmly encourage your horse to approach the object that frightened him. This is called desensitizing and the reason you do this is so that next time your horse sees this item, he will not react to it. Praise your horse for approaching the item that scared him. Talk calmly and soothingly to him. Do not allow him to run away from the object or area he fears. Continue exposing your horse to the source of his fears until he is no longer spooking at it. Continue your ride as if the horse had never spooked. Ask your horse to focus on a task and continue riding him with his mind engaged in whatever you are trying to accomplish or doing.  If you fall off your horse when he spooks, you need to stay calm and get back on. 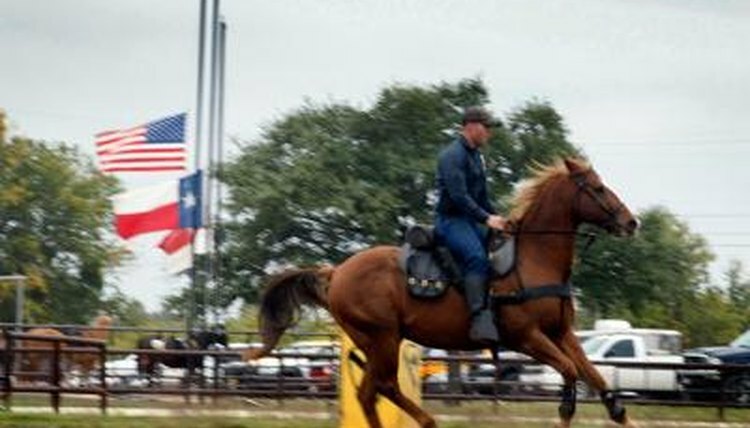 You do not want to teach your horse that spooking is a good way to get out of being ridden.  If your horse tries to run away with you when he spooks, you may need to ride him in a circle until he calms down.  If your horse is very spooky, he needs to be desensitized to a variety of stimuli and worked with on building his confidence. Hire a professional horse trainer to work with your horse if you can not manage his behavior adequately.